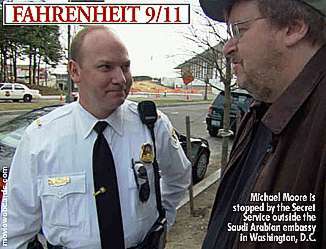 The standing ovations went on and on for Michael Moore's Golden Palm winner, Fahrenheit 9/11. It's the best movie primer on how we got suckered into the war on Iraq. Philip Cheah reviews. You don't even have to hate George Bush Jr. You just have to be outraged by the war on Iraq. At the 57th Cannes Film Festival, the festival jury, led by Quentin Tarantino, awarded Michael Moore's Fahrenheit 9/11 the Golden Palm for Best Film. Fahrenheit is the best introduction to how crazy we have all been during Bush's presidency. And it's just as crazy when critics argue that the film is politics and not art, that it's a political pamphlet, that it preaches to the converted, that it's only valid till the US elections later this year and that it doesn't prove the accusations. First, it has to be said that Fahrenheit can't possibly be worse than the slew of recent Hollywood comedies - Welcome To Mooseport or Something's Gotta Give - and last I heard, we called those "films". Fahrenheit is far funnier and even has a point of view. That point of view, by the way, is so disturbing that mainstream film critics have resorted to labelling the film as a political pamphlet. If Fahrenheit preaches to the converted, then the converted must be a minority, because many of us among the 4,000 foreign journalists in Cannes were astounded by the footage. And whether or not Bush gets re-elected later this year, the War on Iraq will still be around, which will maintain Fahrenheit's validity. And only those who haven't read Noam Chomsky's Manufacturing Consent will believe that the media has an easy time proving accusations. It wasn't easy during Watergate and it's worse now. The mistake most critics make about this film is that they expect to see a definitive statement. But if the whole world allowed the War on Iraq to take place, then surely we have to go back and see just how crazy it was in the first place. And Moore's footage is priceless. Even if you have read about Bush being in a primary school on a PR opportunity when the twin towers were attacked, the picture is worth a thousand words. Here, Moore shows the minutes ticking by while Bush stares into space on hearing about the attack. Then, he shows us Bush's family connections to the Saudis and how 24 members of the Bin Laden family were allowed to leave the US two days after Sept 11. Huh? Moore revisits Bush's election and the irony of Al Gore, in his role as President of the US Senate, refusing to allow black congress members to protest the result as their petitions were not supported by senators. This is counter-pointed later on when Moore shows that the black community is the target for the army's recruitment drive. 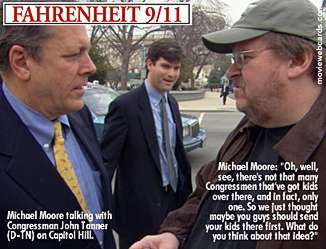 In his usual public-service harassment mode, Moore confronts members of Congress on the street whether they would volunteer their sons to enlist in the army for the war on Iraq. In showing just how America got swept up in a patriotic fever, Moore profiles Lila Lipscomb, an American mother who believed in the war, until her son was killed on the battlefield. Lipscomb realises her error when her son starts wondering just what the war is all about. When Lipscomb goes to the White House to protest, she meets a pro-war citizen. It's a defining moment in the film because it shows just how numb we are when it comes to feeling for another person and how it's easier to buy into the propaganda. 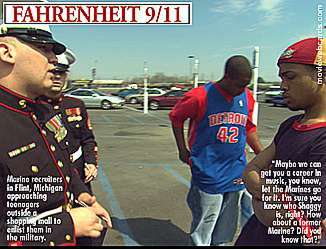 Fahrenheit 9/11 possibly refers to Francois Truffaut's Fahrenheit 451, in which books are outlawed in the future, when the state decides that it is too dangerous for people to think for themselves. In John Powers' Sore Winners, a forthcoming book on George Bush, he shows how despite Bush's obvious dumbness, the press turned against Al Gore for his arrogant smugness. One way or another, we are just too dumb to know better.